I just realized yet another reason why I hate Ubisoft games so much. Its "storylines" are so shallow as though they're made up on the spot, and you can really tell that it's trying to achieve nothing other than hyping people up in any way it can (I'm sure it works wonders on kids and teenagers). Even the soundtrack was ripped straight out of King Arthur : Legend of the Sword, because god forbid spending time making something unique when you can just pick something you heard in the cinema the other day. Ridiculous. Run of the mill. Again and again. Enjoy the PvE grind boys, gotta afford that protection money. It's funny to see replays of old mistakes. There's one for Naval Action too. While the textures shows the hull peppered with holes - and that's not even the weak side, it's the full-health one. Good summary of how gamey the multi-repair system is. Dollars? The monetization is real, budget resolved until 2035! But really though, just as with flags going from 600,000 being worth a small fortune to people buying 10x troll flags just for kicks, fixed prices are bad, 48 hour cooldowns are good. What happened to the old idea of having two separate pirate factions? One "pirate nation" so that we don't hurt the feelings of J4ck Sp4rrow, and one that exists under the ruleset of the current impossible nations. Maybe even working in a more clan-based approach within it so that we can try/have that out without overhauling everything? Proof! SLRN is now SLNR! All tribunal cases are levied at individuals, none at entire factions. And you were demoted, not just warned. Wouldn't surprise me if a good number of the other participants joined the Russian Empire as well but I have better things to do than look into that. 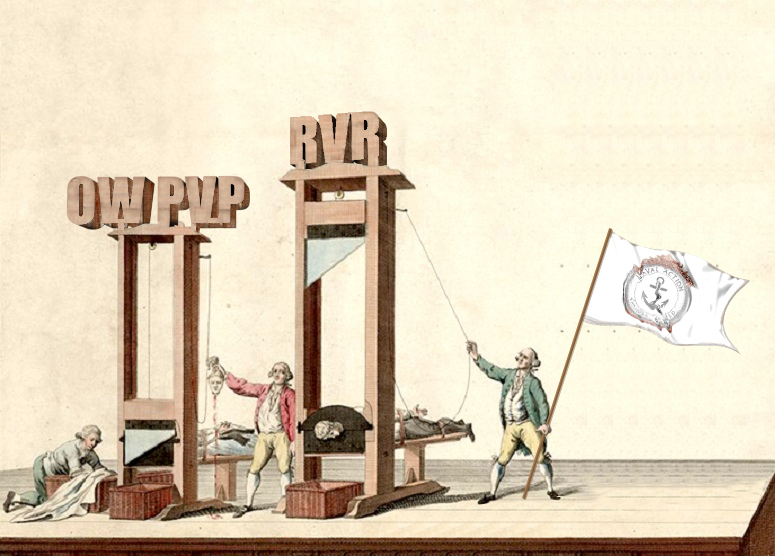 Caught a RUS member farming PvP marks myself and he got punished for it, but I guess nothing counts if it's done before switching to a new nation. Got a bit over-eager to explore the open world, ran away in the beginning where you're supposed to get yourself a horse so I've been walking almost everywhere - and now I realized that I had to do the main questline to learn how to parry and whatnot, combat has been a bit one-sided without that and without dodging at all. At least I've got myself setup with a bit of a morally acceptable scam of cooking poached game meat and passing off venison as beef and boar meat as pork to the local grocers. Having an absolute blast in it thus far. - Lost all the starting money intended for charcoal on gambling, became desperate, had pick and sell flower bouquets and part with some clothing to make it back somehow. - Was going to be an upstanding citizen until I got seduced out of my remaining 40 groschen by a bathhouse wench and had to resort to doing shady work for the miller. Found an expensive amulet in a crow's nest while doing that work and pawned it for 250 groschen ; take your money and sod off miller! - Got a bit lost in the woods at night after chasing and dispatching a pathetic bandit who surrendered as soon as I drew my sword, couldn't see a thing so I thought I'd bee-line through the woods, promptly went towards what looked like an open field to just to be able to see anything at all, what I didn't see was the cliff just behind the bushes... Quite refreshing compared to most games nowadays. Just as with alliances breaking it last time around, I don't think it's going to go well on a global server. Semi-permanent national allegiance and denying as much cross-timezone RvR as possible is the only thing holding it together at the moment - to say that it "works" is a bit of a misnomer. Wouldn't look forward to what the players would get up to with free-flowing clans and clan alliances, timezone monopoly 2.0. Which is too bad since alliances and clan-based warfare is otherwise better and more interesting. Does this mean that Graf has to admit Swedish strategic and diplomatic superiority?